Hiking socks form a vital part of your hiking equipment. Not only do they work to keep your feet warm and comfortable but they also help protect against any blisters and add to the support that your feet need. Getting the best hiking socks then is obviously important to your hiking experience. Choosing the best backpacking socks though can sometimes be tricky as there are a few things to consider such as the material they are made from and the support that they can give you. After that, it’s important to consider aspects such as fit, comfort and weather resistance among others. That’s where we can help as we’ll explain through all the key features so you know exactly what you are buying and have completed hiking socks reviews on the ten best products on the market. Once you have read through this guide, you’ll be fully confident in finding the best socks for you. 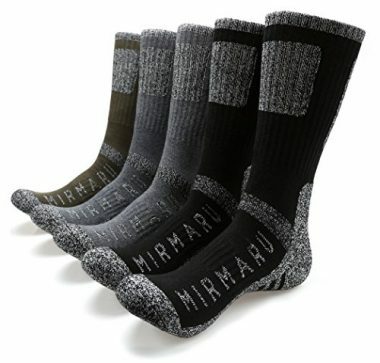 MIRMARU are a company who produce some of the top rated backpacking socks on the market and that is no different with these hiking socks for men. The socks are mostly made from cotton with 40% polyester and 2% spandex in order to give them a balanced blend of materials. They offer up a high level of performance and are ideal for a wide range of different activities, including hiking. The socks are designed to keep you your feet warm and dry while still being strong and durable at the same time, to offer you all the qualities required. The socks also feature reinforced fibers and pile cushioning in the underfoot area and are also designed with compression and elasticity in mind so they are able to support your arch and your ankles as well as making sure that they stay on your feet without rolling down. In terms of socks for backpacking, they don’t get much better than these socks from Darn Tough. They are available in a wide range of colors which gives you plenty of options when it comes to their style. These socks though are going to perform exactly as required for your hiking adventure. The fit of these socks is perfect and it will ensure that they never slip off your feet, they never bunch up inside of your boot and they won’t create any blisters either, which can be a huge problem. They are very well made and should be able to last you for a very long time. These are socks which are constructed from fine gauge merino wool which is going to be both anti-microbial and anti-bacterial which will help to keep your feet in a healthy condition. 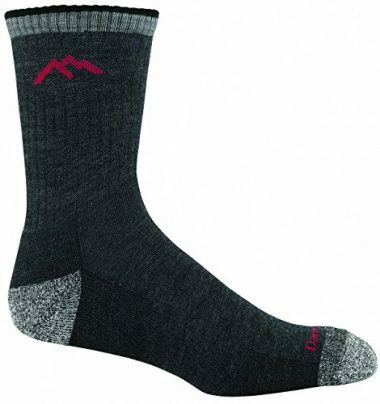 These socks are highly rated and perfect for hiking and other adventures. 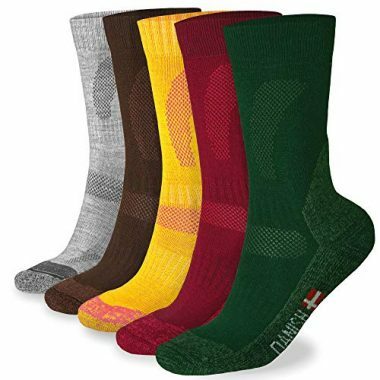 These socks have a blend of materials which is intended to give it the best of both worlds as it has the comfort of merino wool but also the durability of nylon. The sock is designed in order to give you the right compression and arch support for your feet. It also has a reinforced heel and toe which will give you the greatest level of comfort and protection with a layer of elastic at the top to ensure that they stay on your feet at all times. They have a layer of breathable insulation so that your feet stay warm without overheating. The material of the socks will be able to wick away moisture from the feet to stop them from getting clammy and the natural properties of merino will help to prevent any bacteria forming to leave your socks odor free. They are machine washable too for easy care. DG Hill offer three pairs of socks which come in the colors of black, brown and grey. They are mostly made from merino wool but also have added nylon for durability and spandex to give them the stretch requires. Overall it makes a powerful blend for a great fitting sock. 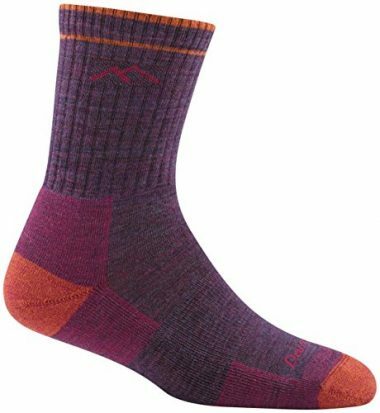 The merino wool contained in the socks will make them very comfortable to wear and you might well be tempted to wear them around the house, as well as on your camping trip. They have a reinforced heel with built-in arch support too for a high level of comfort. They are designed for cold weather conditions and will work very well in the winter and could even be used for skiing, to go with being perfect for hiking in cold weather too. It’s a very popular sock and one of the most sought after on the market due to their great blend of comfort and durability. These women’s hiking socks are some of the best of the market and have a very high level of quality. They are another which have a merino wool blend but with less wool that can be found with other products at 67%, with 29% being nylon and the rest being spandex. 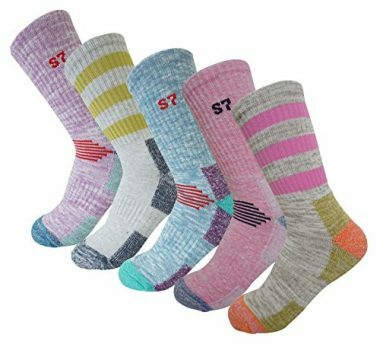 That gives the socks a very high amount of durability which should be able to last you for a very long time which is backed by their lifetime guarantee so you know that you are going to be getting a high-quality and well-made product. The socks will give you a performance fit to ensure that they stay well balanced on your feel for a continuous level of comfort. They are available in a great range of colors from the more standard options to the multi-colored types. These are great socks which will work equally well as summer hiking socks as they will winter hiking socks. If you’re looking for a bit more style out of your sock and want a splash of color then these might be ideal for you as they are available in red, yellow and green as well as more standard colors. 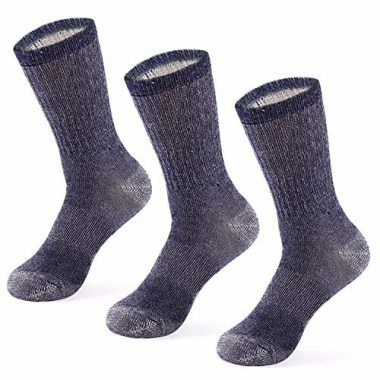 They are a heavily blended sock and are made equally in thirds from merino wool, acrylic and polyamide. That blend will allow the sock to wick away any moisture but also allow air to easily pass through the sock to keep them cool in the summer. That airflow is helped by their specific ventilation zones that are in the sock. They also have other great features too such as their padding from the heel to the toe and the socks ability to absorb any shock in conjunction with your boots and also to avoid any chaffing. 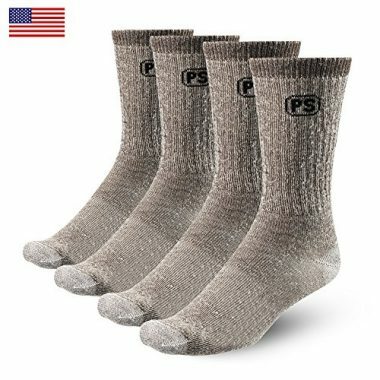 These are brilliant wool hiking socks from People Socks which are very highly rated by those who have used them. They are made from mostly merino wool with nylon, poly and spandex all added to the blend. They are machine washable for easy care and are highly durable which mean that they should be able to last you for a very long time. They will give your feet a high level of support and ensure that you have a comfortable hike time and time again. The socks will come up to the calf and are shaped in order to give you extra cushioning in the footbed but without having any extra bulk in the sock. They are very comfortable and will help to ensure that your feet aren’t sore after a long day of hiking. These women’s socks are mostly made out of cotton with a blend of a few different synthetic materials thrown in with it. They are available in a nice range of different colors and sizes too so you are sure to be able to find something which matches your style. The socks feature a midweight extra pile cushion padding in the heel and the ball of the foot which is going to be able to protect is from shear as well as blisters enabling you to go on a long walk without having to worry about coming back in pain. The socks will also be able to wick moisture away from your feet which plays a very important role in keeping them dry and the socks have an anti-bacterial quality too. They are easy to slip on and will stay stuck to your feet throughout your whole adventure. These are ideal socks for hiking as they tick every box in regards to what makes a great hiking sock. They are very highly rated by those who have worn them so you are able to have confidence that you are going to be getting a quality product and one which is going to last for a long time. The socks are made from 65% merino wool and you know that you will be able to get the level of comfort that the material provides. The socks will help to prevent any chafing which might happen with your hiking socks and allow you to hike with confidence. The socks have reinforced heels and toes which is going to be able to give you a very durable sock and one which is going to be able to last you for a very long time. The socks will help to keep your feet warm and are designed to perfectly stay on your feet at all times. Wigwam ware another company who have been able to produce a very highly rated sock and one which is going to be able to give you everything that you are looking for from a long hike. They are available in a range of basic colors and all the size options that you should need. The socks are made from a wide blend of materials including spandex which will help to give them a tight fit to avoid any chaffing. They are machine washable and have a very smooth toe closure so you will be able to get that comfort all day long. They also feature a dense footbed which will help to prevent your feet from getting sore and have an abrasion resistant Achilles cradle which will further help the durability of the product. Overall this is a great sock and one which should be able to be perfect for all your adventures. When it comes to the materials that can found in hiking socks, merino wool holds the clear lead in terms of the material of choice. Cotton and polyester socks can still be found but they are starting to get rarer when compared to merino wool due to the vast range of qualities that merino has. The reasons that merino wool has become the material of choice is that it ticks all the boxes when it comes to what makes a camping sock. First and foremost it is highly comfortable which is what all hiking socks need to be. That regular motion of your feet can happen thousands of times during a hike, so your socks have to remain comfortable. What merino wool also does extremely well is its ability to wick away moisture which is the ability of a material to take the moisture that it coming off your feet and allow it to evaporate away from the surface. This stops your feet from getting clammy and wet which can be horrible in cold conditions and can make chaffing a lot worse. Merino wool is able to wick away this moisture while still remaining breathable and enabling air to be able to flow through the sock. This allows your feet to stay warm in winter and them to keep cool in the summer. Another added benefit of merino wool is that it has anti-bacterial properties which will prevent your feet from stinking. The reason cotton socks are rarely seen these days is that they simply don’t have all the qualities that merino wool has. While cotton may be comfortable when you put on the sock, they are a heavier option but also absorb moisture and will stay wet for the duration of your hike as they don’t dry very easily either. Cotton though can still be a good choice when it comes to day hiking. Polyester isn’t quite up to the standards of merino wool but it doesn’t have some good qualities. One of them is how durable the material is, as it will last for a very long time and longer than a pure merino wool product would. It also doesn’t absorb much water and dries very quickly. It doesn’t though have any anti-bacterial properties so can stink very quickly and doesn’t have the same level of comfort. You may have noticed though that very few socks are actually made from pure merino as they will be blended with other materials in order to hijack their qualities to add to the overall quality of the sock. There is no perfect percentage for this but you generally see a majority of merino with polyester or nylon (or both) mixed in for that added durability. On top of that you often see spandex included in order to have that stretch to keep the socks on your feet. The fit of the socks is going to be vitally important to your overall comfort and the first step in getting a good fit is to simply make sure that the length of the sock is going to be high enough for the height of your boot. You want to ensure that you have sock protection up to and beyond the ankle cushioning on your boot. This will help you to avoid getting blisters for your boots rubbing up against your skin. Overall it’s probably going to be a better choice to opt for a higher sock as not only will it give you a layer of insulation but it will also protect your skin from any insects that might be low to the ground. It does also depend on the type of activity that you might be doing too as if you are hiking in warm and dry weather with a low-rise boot or hiking shoes then it might well be a better idea to get smaller socks to allow your skin more place to breathe. It’s naturally important to get the right size of sock so that it is able to fit your properly. These socks can come with specific support in different areas for a specific reason. You want to make sure it is able to do its job properly which it won’t be able to do if it has not been fitted correctly. 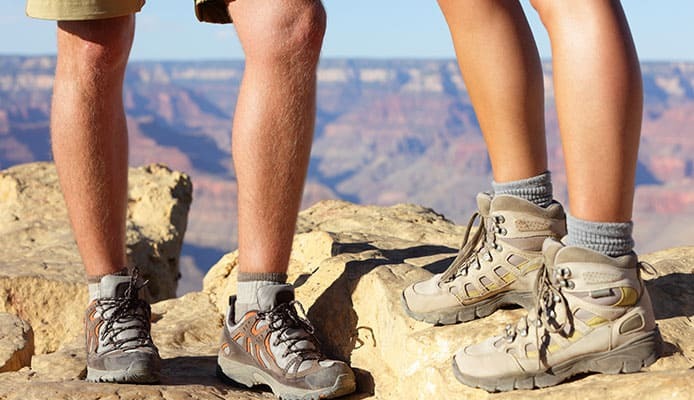 Regular socks are merely just there for comfort and to be a protective layer between you and your foot but in terms of hiking socks, they need to be able to offer you a level of support and they are able to do this in a number of different ways to ensure that you have a comfortable hiking experience. One area of support that a lot of them give is in the form of extra cushioning that can be found on the underneath of the sock. This will be able to give an extra layer of shock absorption to the ball and the heel of the foot to stop it jarring with the thousands of steps you’ll be taking. Another great feature that some models have is a layer of elastic which will be around the arch of the foot. This is great for everyone but especially those who need all the support they can get with their arches and will be able to help the sock fit perfectly on the foot. General support can often be found in the thickness of the sock but you also want it to be tough as well. A sock can’t be too thick otherwise you’ll struggle to get your foot in your shoe but enough support should be given to it. There are some socks which offer features such as abrasion resistance on the ankle as it’s a place which can take a lot of wear. Looking for these features is a great way to ensure that you are going to have a sock which will help to keep your feet in a healthy state, even after a long walk. This support is only going to be useful though when used in conjunction with a great hiking boot, as if you have a poor hiking boot then not even the best socks would be able to save you. In terms of what is the first and foremost important feature when it comes to socks then it’s going to be comfort. It’s why everyone wears them in the first place as you don’t want your bare skin rubbing against the raw material of your footwear as it would soon be painful if you are walking long distances. This also links in the quality of your shoe though as a sock can only give you a certain level of comfort. If you have boots which are cramped in the toes or aren’t wide enough for your feet then you are quickly going to be very uncomfortable and it’s probably the best idea to try and solve the problem with a new boot, as well as new socks. 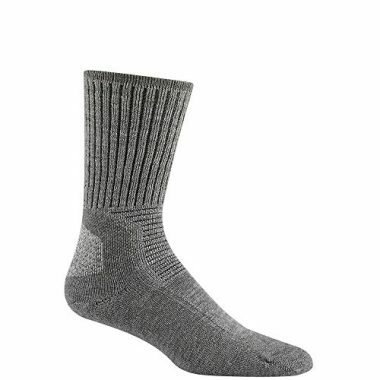 As we have mentioned already in terms of materials, there is one clear winner when it comes to comfort and that is merino wool socks and if you are going to be hiking for a long time then it’s going to be ideal to get a pair of socks where this is the majority of the material to ensure that you are as comfortable as possible. 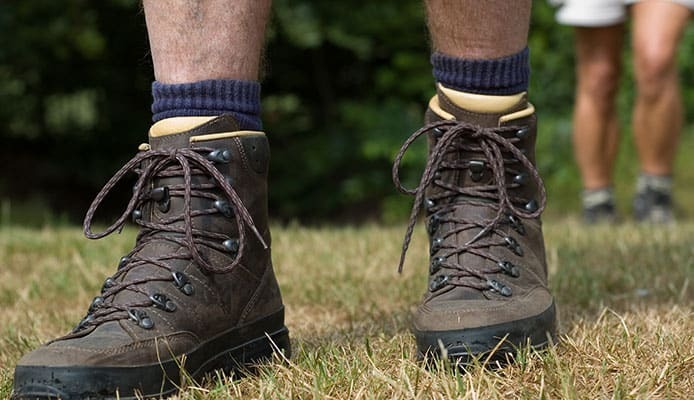 If you are a fair weather hiker and only ever really see yourself doing short walks when the sun is shining then this is going to be less of an issue and choosing cotton or polyester socks would be a fine choice. It’s important to also know the difference between regular wool and merino wool too as you don’t want to get caught out. The key difference is that regular wool can be itchy whereas merino wool isn’t, so make sure you are buying the best. There are other key features which add to the comfort levels too such as the socks ability to wick away moisture as if you have a sock that stays we then it can leave you very cold and very uncomfortable. You also want it to be breathable too in order to get that air circulating through your foot. There is also the obvious link with support too as the extra supportive padding that you can get on the ball and the heel can not only save you from injury but it will also simply make for a more comfortable walking experience, especially if you have the type of feet which can quickly get sore. The first barrier to weather resistance is going to be with your boots and the importance of this will depend on what type of climate that you are going to be hiking in. If it’s going to be wet then you want boots which are as waterproof as possible and socks which will be able to feel with any water that does seep in. This is one area where cotton socks really fail as not only do they absorb a lot of moisture but they take a long time to dry too and therefore don’t offer a lot of weather resistance. Merino wool socks still absorb some moisture but they do a better job at keeping your feet warm and will dry more quickly too. In the colder temperatures you would naturally want a sock which is going to be thick and have a good layer of insulation; it’s also a good idea to get a higher sock so you are able to protect more of your skin. This is another where the fabrics ability to wick away moisture is important as it will take away moisture from your feet which could otherwise become frozen. That ability is also important in warmer conditions too. Even though you would ideally want a thinner sock the ability to take away the moisture from your skin will stop your feet from becoming clammy which can feel uncomfortable but also make you much more prone to blistering and other foot problems. It’s always going to be important to be able to match your socks to the situation that you are in. If you don’t match them with your environment when you could quickly find yourself in an uncomfortable position as you might have socks with aren’t able to keep your keep warm or in contrast, socks which might make you far too hot. In the majority of circumstances it’s probably going to be the best idea to get more lightweight socks as the extra insulation that will be given to them won’t really be required if you are constantly on the move when you’re hiking. A lot of people only hike in spring, summer and fall, if that’s you then a lightweight sock would be more than enough. This is where you might need to invest in two different types of socks if you plan on hiking in the winter. Heading out there in the cold with light socks on would probably make for an unpleasant experience as would hike in the heat with heavier socks. Having two types and changing over when the weather does is probably the best way to go. The thickness of the sock though also plays a role in your overall comfort as to have that extra padding which can protect your feet will mean that you will be having a thicker sock. This can be a matter of personal preference but it’s important to point out that in drier weather your feet won’t be getting wet, which is usually a major source of discomfort. 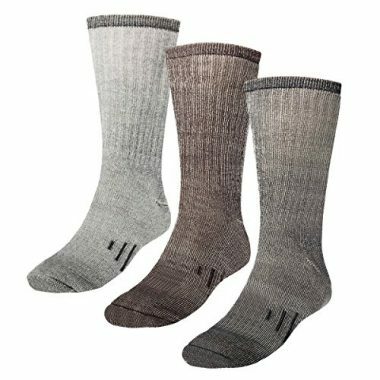 If you’re paying good money for a hiking sock then you want to make sure that it’s going to be very durable but that can vary from one company to the next, which is why it’s always a good idea to buy from a reputable company and ideally one which is going to be able to give you some sort of guarantee. Wool does tend to have a habit of pilling over time (where small balls of fiber form on the surface) but the sock will still remain solid and this can be lessened with more considerate washing techniques, both with machine washing and drying the product. One good place to check the durability to a product is with the user reviews which can be easily found. If any people have any long-term issues with the durability of the product then you’ll soon know about it and this can separate one product from the next as you will be able to see what quality is and what isn’t. In terms of materials then it’s often a good idea to look for a sock which is a mix of different materials which will have the comfortability of a cotton or a wool then that will often be added in with the durability of a polyester or a nylon. This gives you the best of both worlds and allows them to stay strong for a long time. We referred to it in the last section but it’s important that you take proper care of your socks in order to make them last for as long as possible and stay comfortable. The first crucial element of this is that if you plan on machine washing them, then make sure that you follow the instructions otherwise you could well end up ruining the socks. Most of these socks can’t be machined dried and it’s for the best to avoid that all together anyway. It’s best to let your socks air dry in order for them to do it in a natural way and not be subject to the heat or motion that will be found in your regular drying machine. If you want to spend the time and the effort then it’s going to be the best idea to ash them in cold water and then line dry them. This will ensure that no other problems occur and that you are taking the best possible care of your socks. Harsher washing methods are likely to increase any pilling on the surface and also lead to shrinkage. One solution that can appeal to many people is to have an inner liner of a thin merino sock and then have a second sock over the top so you have the dual layer which can also help to avoid blistering as your inner sock can rub against the outer sock rather than on the boot. Having this inner liner with an outer sock will also allow you to have more flexibility as you’d be able to remove the outer sock when it is too warm to stop your feet from overheating. This is a personal choice which many people prefer than the traditional method of wearing just one sock. Q: Why Do Hiking Socks Have Spandex? A: Spandex can give your sock a level of stretch to it which is useful for a number of different reasons, which I why you see it in the majority of socks that are on the market. It is able to give your food a good layer of flexibility while you are wearing the sock which can add to the overall comfort of the product. Another positive feature that it can have is that some socks will have a band of elastic spandex around the arch which can increase the level of support that it has. This is especially useful for those who have problems with their arches as it is able to help you to remain comfortable and pain-free for the whole of your hike. Also there is the factor is simply being able to keep the socks on your feet. A lot of these hiking socks are pulled up to the calf and therefore it can be hard to keep them on when compared to regular socks. If they roll down then this can compromise the comfort and support that they give, make you colder and generally just be annoying. Spandex is able to solve this problem and keep your socks right where you want them to be. It’s important that your socks have at least some elasticity if you want them to be able to give you all the support that a hiking sock can. Q: What To Do With The Odor? A: There are a few contributing factors when it comes to the odor which can be found in a product with one of them being the material that they are made out of. Polyester is not a good material at all in terms of trying to prevent odor as it doesn’t have any anti-bacterial properties. The smell that you get from a sock, or any sweat, isn’t actually the swat itself and instead bacteria forming in the warm water which makes it even more repulsive. Cotton socks are too great either but this is another area where merino socks can excel as they will leave your feet smelling much better than normal. If you have sweaty feet though then there’s not a lot you can do except for trying to find something which will get rid of the odor. If you are out camping then washing them and leaving them out to dry will help. In general you want to look for a sock though which has anti-bacterial properties as this will help to prevent them from forming. You also want to wear socks that are going to match your situation. If you are wearing thick socks when you are out in the heat then it is obviously going to make you sweat a lot more and the more you sweat, the greater chance of an odor starting to form in your boot. Wearing a thinner sock in warmer conditions is always a good idea. Another factor is the socks ability to wick away moisture. If it is able to quickly transfer the moisture in your sock out into the outside world then that is going to be a lot better for the smell. In summary you want merino socks with anti-bacterial properties, wear socks which are appropriate for the temperature and make sure they are able to wick away moisture. Q: How To Make My Hiking Socks Last Longer? A: If you are paying a lot more for socks than you would do if you were buying regular socks, then it would be important to make them last for as long as possible so you are getting even more value for money. There are surefire ways to ruin a good pair of socks so it’s important that you treat them with care. This involves making sure that they are washed in the correct way as if you don’t do this then you could quickly find that the material starts pilling for they could well shrink in the wash. If you do have to machine wash them then make sure that you are following the instructions closely and hand wash them and line dry them if you can. 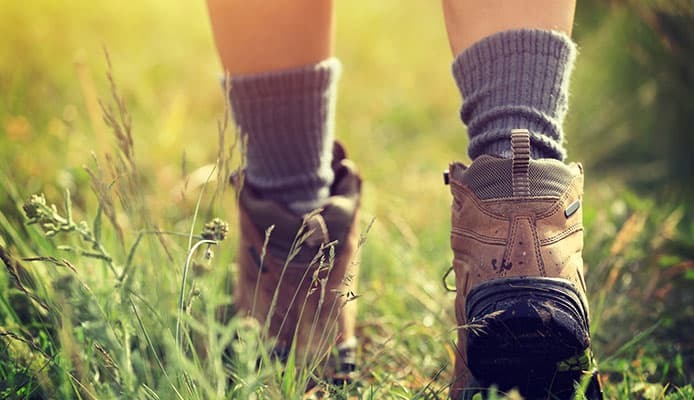 If you are going out hiking then you want to make sure that your feet are going to be well cared for otherwise you are not going to have a good time. If you are backpacking then this is even more important as any foot problems that you have are going to be a longer-term problem and might prevent you from going any further. If you are simply going out for a day hike then it could well be that blistered feet will prevent you from wanting to go out on another hike. That would be terrible and can be simply solved by having the best equipment available, whether that is a hardshell jacket or simply having the best socks that you can buy. Many people have hiked with bad equipment at one stage or another and we know how it can detract from what should be a great experience. Here we want to make sure that you enjoy your adventure which is why following the guidelines that we have laid out in this article is going to be important in getting the best socks available and taking that next step in being able to hike with confidence. Walking with blistered or sore feet isn’t fun but the socks that we have featured here are able to play a vital role in ensuring that it doesn’t happen. In terms of your sock choice it’s important that you assess the conditions that you are going to be camping in and the specific needs that you have, once you know that then you will be able to choose which features are going to be the most important to you. Once you have all the best equipment, then you are going to be able to enjoy hiking more than ever before.